I periodically explain that you generally don’t get a recession by hiking taxes, adding red tape, or increasing the burden of government spending. Those policies are misguided, to be sure, but they mostly erode the economy’s long-run potential growth. If you want to assign blame for economic downturns, the first place to look is monetary policy. When central banks use monetary policy to keep interest rates low (“Keynesian monetary policy,” but also known as “easy money” or “quantitative easing”), that can cause economy-wide distortions, particularly because capital gets misallocated. And this often leads to a recession when this “malinvestment” gets liquidated. I’ve made this point in several recent interviews, and I had a chance to make the same point yesterday. By the way, doesn’t the other guest have amazing wisdom and insight? Back to the main topic, I’m not the only one who is worried about easy money. Desmond Lachman of the American Enterprise Institute is similarly concerned. Never before have the world’s major central banks kept interest rates so low for so long as they have done over the past decade. More importantly yet, never before have these banks increased their balance sheets on anything like the scale that they have done since 2008 by their aggressive bond-buying programmes. Indeed, since 2008, the size of the combined balances sheet of the Federal Reserve, the European Central Bank, the Bank of Japan and the Bank of England has increased by a mind-boggling US$10tn. …in recent years, if anything central bank monetary policy might have been overly aggressive. By causing global asset price inflation as well as the serious mispricing and misallocation of global credit, the seeds might have been sown for another Lehman-style economic and financial market crisis down the road. …the all too likely possibility that, by having overburdened monetary policy with the task of stabilizing output, advanced country governments might very well have set us up for the next global boom-bust economic cycle. If you want the other side of the issue, the Economist is more sympathetic to monetary intervention. 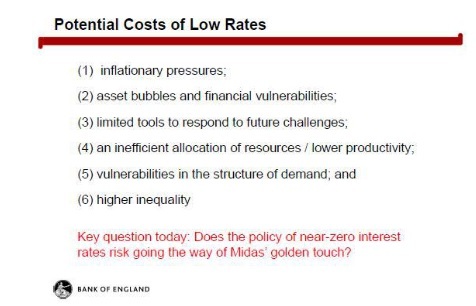 And if you want a very learned explanation of the downsides of easy money, I shared some very astute observations from a British central banker back in 2015. The bottom line is that easy money – sooner or later – backfires. By the way, here’s a clip from earlier in the interview. Other than admitting that economists are lousy forecasters, I also warned that the economy is probably being hurt by Trump’s protectionism and his failure to control the growth of spending. P.S. The “war on cash” in many nations is partly driven by those who want the option of easy money. P.P.S. I worry that politicians sometimes choose to forgo good reforms because they hope easy money can at least temporarily goose the economy. P.P.P.S. Easy money is also a tool for “financial repression,” which occurs when governments surreptitiously confiscate money from savers. P.P.P.P.S. Maybe it’s time to reconsider central banks? Another bad thing happened in 1913. The 17th amendment made Senators elected by popular vote instead of appointed by state legislatures. This weakened federalism and helped make the federal government more powerful. John M. Keynes was a progressive. Many terrible things for this nation started in the era of Woodrow Wilson, with particular emphasis on the year 1913: The Revenue Act of 1913, The Federal Reserve Act of 1913, when Congress abdicated their fiscal, financial and monetary responsibility to the American public. We’ve been on a progressive/socialist/communist road ever since. socialism is a failed socio-economic construct, but allows wealth and power transfer to the few at the expense of the many. Just look at the corpses of socialist regimes littered throughout history for confirmation of this fact. Venezuela is the latest incarnation; soon to be yet another casualty. Free markets and sound money have been proven over time, but there are too few opportunities for graft and corruption. Centrally planned, command economies are doomed to fail. 1) “The statesman who should attempt to direct private people in what manner they ought to employ their capitals, would not only load himself with a most unnecessary attention, but assume an authority which could safely be trusted, not only to no single person, but to no council or senate whatever, and which would nowhere be so dangerous as in the hands of a man who had folly and presumption enough to fancy himself fit to exercise it.” – Adam Smith, The Wealth Of Nations, Book IV, Chapter II, p. 456, para. 10.